HomehistoryFancy A Game Of Cribbage? This game is played with the whole pack of cards, generally by two persons, and sometimes by four. There are also different modes of playing, that is, with 5, 0, or 8 cards. But the games principally played are those with five and six cards. Crib, are the cards thrown away by each party, and whatever points they make are scored by the dealer. 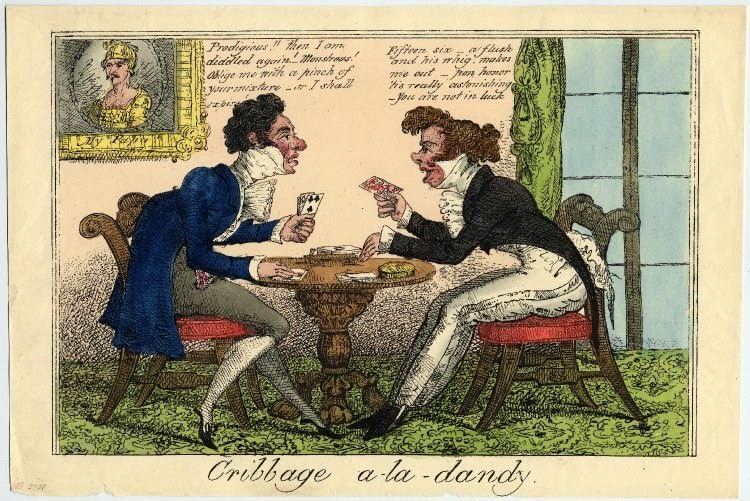 Pairs, are two like cards, as two aces, or two kings, &c. and reckon for two points, whether in hand, or playing. Pairs royal, are three like cards, and reckon for six points, whether in hand or playing. Double pairs royal, are four like cards, and reckon for twelve points, whether in hand or playing. fifteens. Each fifteen reckons for two points, whether in hand or playing. In hand they are formed either by two cards, such as a five and any tenth card, a six and a nine, a seven -and eight, or by three cards, as a two, a five, and an eight. In dealing, the dealer may discover every card he has, if he pleases. But if he shows his adversary’s cards, the adversary is entitled to mark two points to his game, and demand a fresh deal if he thinks proper. Neither party may shuffle or meddle with the cards, from the time they are dealt until they are cut for the turn-up card, under penalty of the adversary scoring two points to his game. Either party touching their pegs, unless when necessary to mark his points, the adversary may score two points to his game. Either party taking out their front peg must place it behind the other. Any by-stander interfering, or speaking in the game, shall pay the stakes lost. Either party scoring a less number of points than are his due incurs no penalty. Either player has a right to pack his own cards, and should he place them on the pack, and omit scoring for them, whether hand or crib, he must not mark for them afterwards. Sixty-one points constitute the game, and the best mode of marking them is with a board pierced with as many holes, and two pegs for each party. On beginning the game the parties must cut for the deal; the person outting the lowest cribbage card is dealer, and the non dealer must score three points, which is called three for the last, and may be marked at any period of the game. The deal is made by dealing one card alternately until each party has five. Each person then proceeds to lay out two cards for the crib. In doing this always be careful to recollect whose crib it is, as the cards which may advantage your own are almost invariably prejudicial to your game when to your adversary. This done, the nondealer is to cut the remaining cards of the pack, and the dealer turns up the uppermost. This card, whatever it may be, is reckoned by each party in hand or crib. When the turned-up card is a knave, the dealer scores two points to bis game. The non-dealer plays first, the adversary next each scoring what the cards may make, either by pans, pairs royal, &c. until thirty-one, or near it, by either party. The remaining cards are not to be played. The non-dealer then counts his hand, and scores the points it yields. The dealer then marks for his hand, and afterwards for his crib.